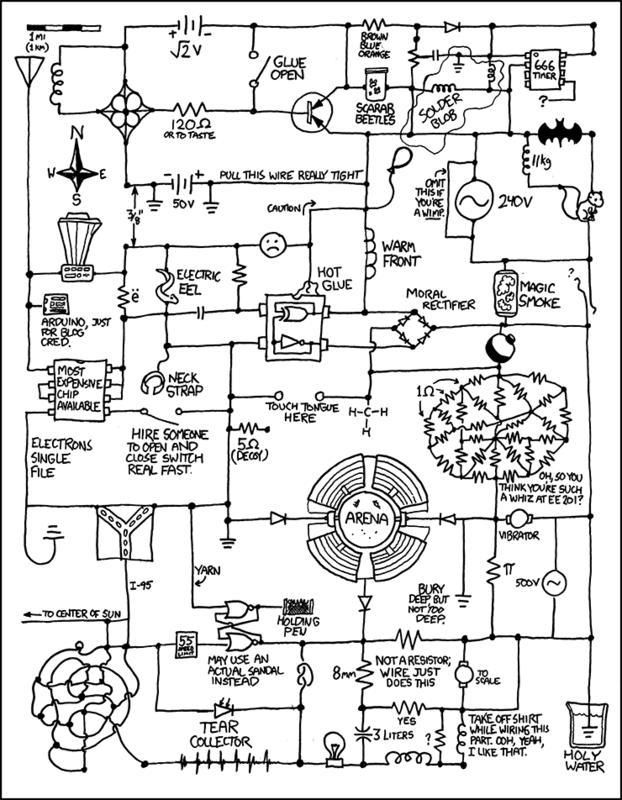 An entry to Fortnightly Topic Challenge #35: Restricted Title 1 - based on the following xkcd. 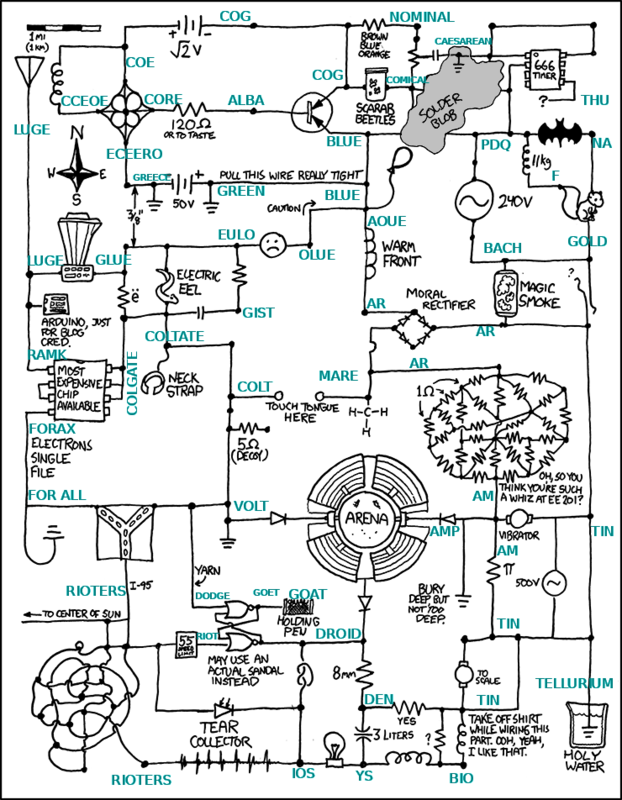 Circuit diagrams can be quite difficult to understand, so here are some documents that will hopefully help you grasp this concept! CAUTION: There are spoilers ahead. To respect your readers, please ROT13 the first letter of each word. They'll appreciate you helping out! Junctions: These don't change anything on their own, but some components may change words passing by! Wires: These provide the connections between junctions. Usually nothing special, but read the section on interference for more details. Also, be careful not to bend your wire too much, or it might break and no longer work. Bridges: These just allow wires to cross over other things. They have no effect on the word. Diodes: Keeps electric current going in one direction. Keep away from solder (like not even NEAR it), however, or it'll stop functioning. Grounds: Tends to short things through safer paths. Resistors: You should be able to read a word from some direction. Depending on how the resistor is graded, different things may occur. See the section on Resistor specifics for more details. Capacitors: Capacitors are set from right side. Then they affect the left side in passing. Variable Resistors: These don't work like resistors, and instead work like capacitors. It wants to be a precise match, but ends up needing to be heard instead. Feed-through Capacitors: These don't work like capacitors, and instead work like resistors. It wants to spell out a word, but ends up being a proper noun instead. Inductors: Inductors are finicky creatures, so you'll have to consult the following set of rules to see how they work. See the section on Inductors for more details. Transistors: Transistors contain two parts. First, collectors. From the etymology, "trans-" means to transfer, so just like "transfer" sounds initially, you should transfer initial sounds. Second, once collected, a further "word" must be computed from the resultant two "words". AC Power: Being alternating, these power supplies should show character. DC Power: These are more direct forms of conversion. Take the last 1-2 letters, convert A=0 ... Z=25, and add/subtract accordingly to voltage (round up to the nearest whole number). It's a common misconception that + and - are the way they are - in fact, - should be +, and + should be -, but we keep this notation mostly for historical purposes. Blender: You know what a blender does. Come on now. Photodiodes: It's a tear collector. As labeled. ECG: It's a tear collector. As labeled. Holy Water: Code word for "water found in our nuclear reactors". Expect possible bombardment of alpha particles! Hot Glue: Doesn't work to fix things. What did you expect? Anything that it touches is guaranteed to not work anymore. Antennae: Antennae are used to tuning into the radio. 1) There is a 4-letter substring that is a rock, replace it with a single letter such that the new word is a rock. 2) There is a 4-letter substring that relates to industry, replace the last two letters with a single letter such that the new word is a word relating to industry. The Cloverleaf: AKA the News Core, er, new score. What's the new score? Well, the cloverleaf is here to tell you! After everything is drawn and then sewn up, what can we say? Yarn: One of these words is a model of a car. The other is a (different) car brand. They both mean roughly the same thing, although the former requires some knowledge in a certain sport. Holding Pen: Holding a pen will let you spell things correctly. They hold animals too. Light Bulbs: They give off light. Flip-flops (two NOR gates coupled together): These are used to split letters up evenly. For each input, cut words in half (ties broken on the right). Then take both first halves and insert to the bottom, and take both second halves and insert to the top, alternating between the two inputs. NOT: AKA Inverter. Takes the opposite of things, duh? The 666 Timer: Please see the following diagram for the spec. 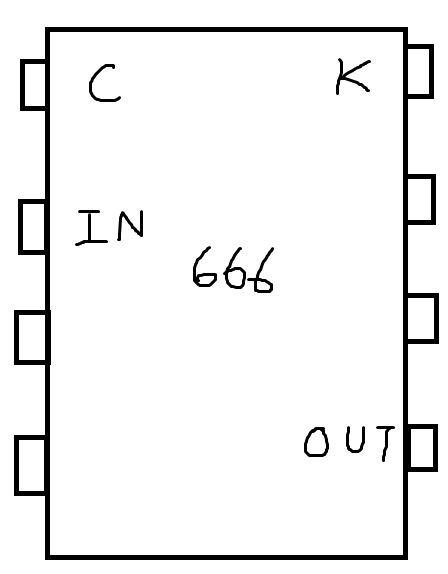 The 666 works in rather cryptic ways. C provides the type, K provides any additional information needed, which allows it to take IN to OUT. 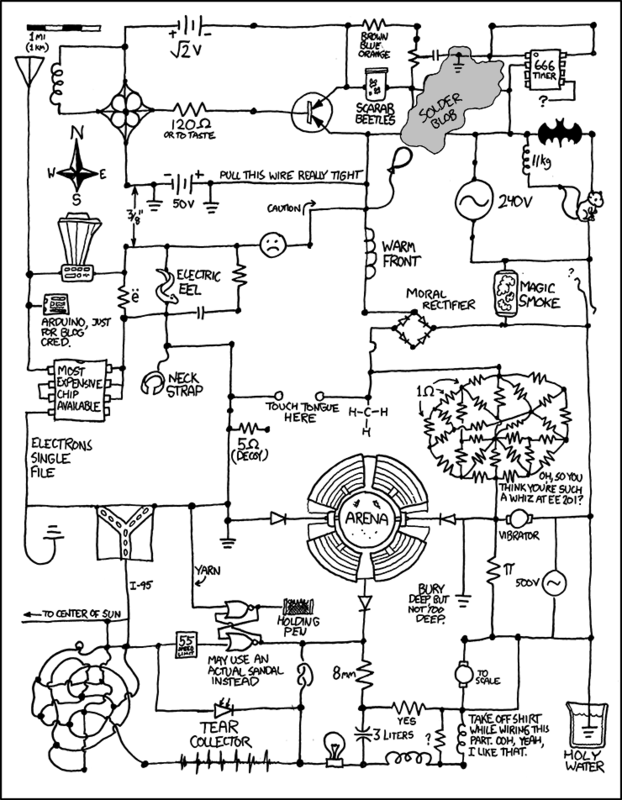 This is a very important piece of any circuit, because, as you know, the timer sets the time. Most Expensive Chip Available: Please see the following diagram for the spec. Honestly we probably wasted way too much money here, this chip doesn’t even look too complicated. Some appliances may affect electrical currents traveling next to them, so be careful! Resistors: Usually doesn't interfere, but look at the section on resistors for possible problems. Vibrators: Affects things turning at nearby marked junctions. Wait 12 hours, flip and merge. Neck Strap: Just like a collar has a tag, add or remove a phonetic number "tag" when passing by. Electric Eels: Does nothing, but can shock and kill you if any nearby strings don't contain E or L. So... try to make sure they do! Balloons: Balloons float. Letters found in the string "balloon" must be changed, moving earlier up in the string by one position. Or down. Depends on which direction you're going. Drafting: For particularly egregious not-to-scale gaps, switch the first letter of one side with the last letter of the other side, then reverse both strings. Hanging Wires: If you don't know where a wire goes, you don't know what will happen to words in passing! We can only conjecture what will happen. Organic Chemistry: Functional groups are very reactive! They tend to typically engulf anything that passes by. Here is a handy guide to common abbreviations. 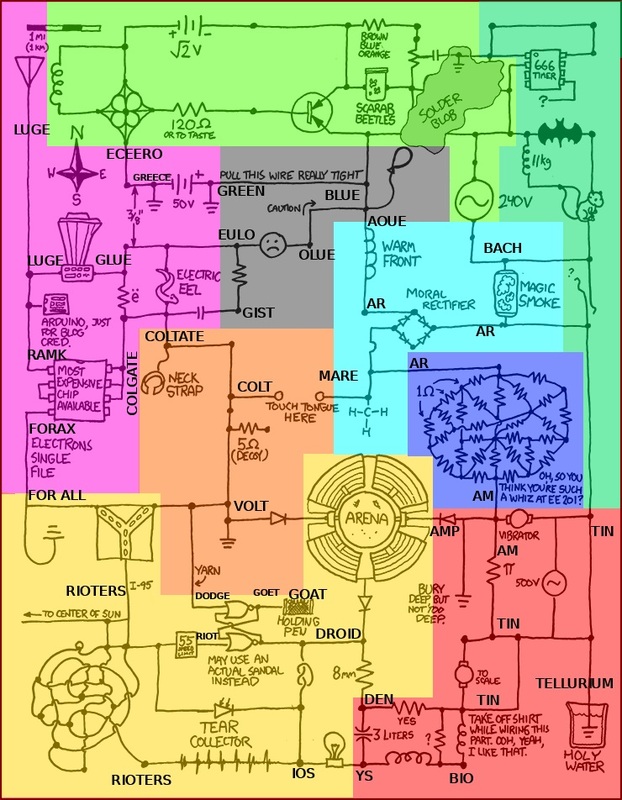 Electricity: Of course, what would an electronic circuit be without the concept of electricity. You see, basically electrons come in 26 varieties. They like to form words, and even non-word strings. Emotional Psychology: Turn that frown upside down! I don't know why he's sad... maybe it's due to the nearby funeral happening. Aww. Redshift: As things travel away from you really quickly, they may exhibit redshift. You may try this out at home: simply take a piece of string, and stretch it out (preferably at a velocity of at least 1/10 the speed of light). You should see redshift, to the tune of one color spectrum's difference! Tonguing: Tongue play results in the changing of genders. If your 666 Timer needs numbers for K, fear not, this chip has an inbuilt typecaster! Let A = the total value of a word when converted A=1 Z=26, and let S = the scrabble score of the word. Then the number to use is the positive difference between A and S. Simple! Queueing: Electrons can travel single file, but as it turns out, these corridors are too narrow for the widest electrons over 20 points in size. These spontaneously split up into two smaller electrons each half the size of the old one. A character's HP value is represented by A=1 all the way to Z=26. Unless otherwise stated, characters get one attack every turn. Turn order starts from A to Z. Turn order can change during the turn depending on how HP changes work out. Turn order ties: left team first, then right. Left characters first, then right. Same goes for targeting ties. To set up: sort the characters on each side alphabetically from left to right. Assassin       Deals 3 damage to the lowest HP enemy. Can't be directly targeted. Bard        For the rest of this turn, your team does double damage. Not stackable. Channeler   Merges with the lowest HP ally (that is not this character), making a single new character with the sum of HP. This character gets another turn. Droid       Can't be attacked by an assassin - instead, next lowest HP gets hit. Deals 2 damage to the highest HP enemy. Esper       Copies the action of the lowest HP enemy. Flamethrower    Deals 2 damage to the highest HP enemy, and all surrounding enemies. Guard       For the rest of this turn, takes all damage from anyone else on the team, unless another guard has already acted. Healer      Heals the lowest HP member on your team for 4 damage. Inventor        Creates a new, 3+T HP character for the team this person is on, where T is the turn number. This character does not get a turn this turn, and is placed at the front. Janitor     Gains 1 HP for every dead character so far. Killer      Kills the lowest HP enemy, but loses an equal amount of HP. Lycanthrope Deals 2 damage to the highest HP enemy, and heal 2 damage. Mage        Deals 1 damage to all enemies. Neophyte    If the lowest HP targetable enemy has less HP than your team's lowest HP targetable, attack it for 2 damage. Otherwise, heal your team's lowest HP for 2 damage. Oblivion        Reverts back to what this character was originally at the start of the game. Paladin     Deals 20% damage to the highest HP enemy, rounded up. Quantum Mech    Deals 50% damage to the lowest HP enemy, rounded up. Reaper      If the highest HP enemy is higher than 18, instantly kill it. Time Mage   Gives the rest of the team another turn. Underlord   Grants immunity to the lowest HP enemy for the rest of this turn. Victim      If attacked by anyone, retaliates by dealing double damage on the attacker. Witch       Causes any remaining enemies to lose their turn. Xenophobe   Attacks the lowest HP ally for 2 damage, then switches sides. Yeoman      If there are an odd number of enemies, deal 7 damage to the middle enemy. Otherwise, deal 3 damage to both middle enemies. Zeno        Deals 50% damage to all enemies, rounded down. This section will be a deeper dive into the world of resistors and inductors. "E"-resistors: These don't create a word. However, words from both sides should be related, as a sometimes white and somewhat viscous substance. No, not that! Get your mind out of the gutter. 1-ohm and unlabeled resistors: These also don't change the length of the word. They're just nice like that. Warning: Leaving resistors unattended and not plugged in at both ends can result in spontaneous first letter changes. Warning: Pirated resistors tend to get things backwards, and also coat words with a poisonous organism. So beware! This is why you should not pirate resistors. 0) Start with the string on the right or the top - it should be three letters long. 25.3) If the string contains the letter Y and the Y is not at the front, delete the first letter, then repeat 25.3. 26) If the string contains the letter Z, shift the first letter back 3 places and delete the last letter. 27) The string you get should instruct what to do with the original string. 28) Repeat steps 1-26 again! We need to track down that warm front! The warm front passes through as many territories as it can, passing through each territory at most once. 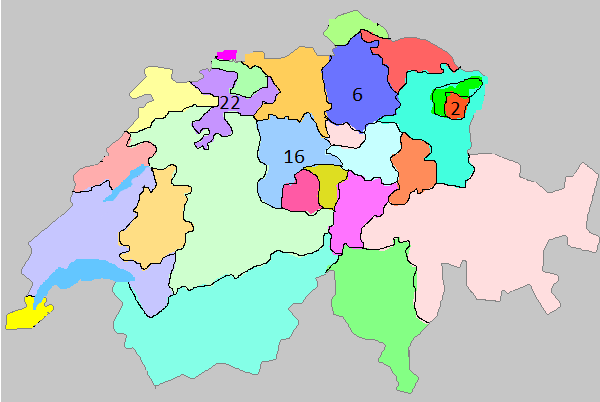 Some numbers have been given to you; they represent the order (counting up from 1 to some specified upper number) of the territories that it passed through has been marked. Skip 1 canton. There are a total of 25 cantons to traverse. Skip both islands (Sardinia, Sicily). There are a total of 93 provinces to traverse. For extraction, add 3 to all numbers. 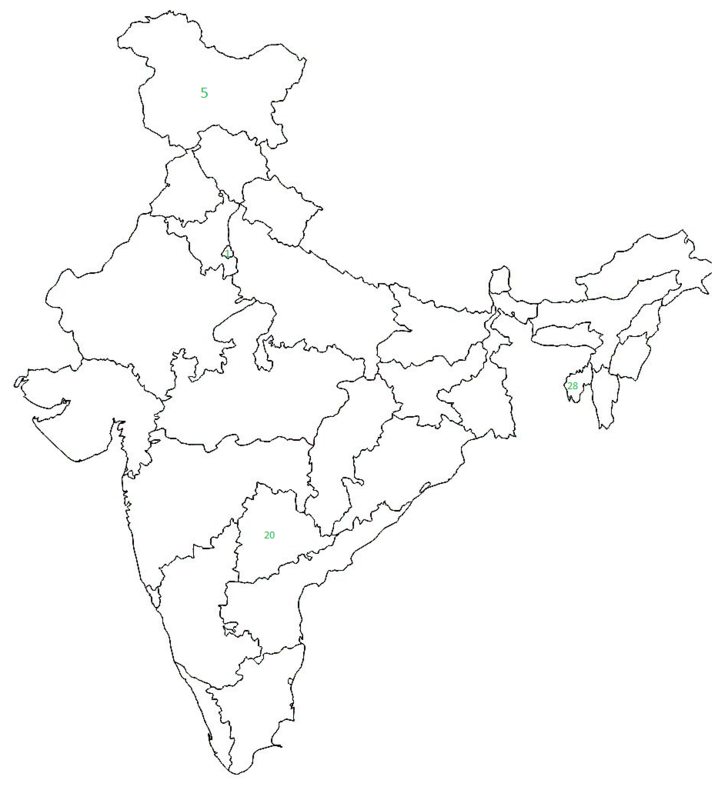 Skip 2 states, and also skip all union territories besides Delhi, which has been marked with the number 1. 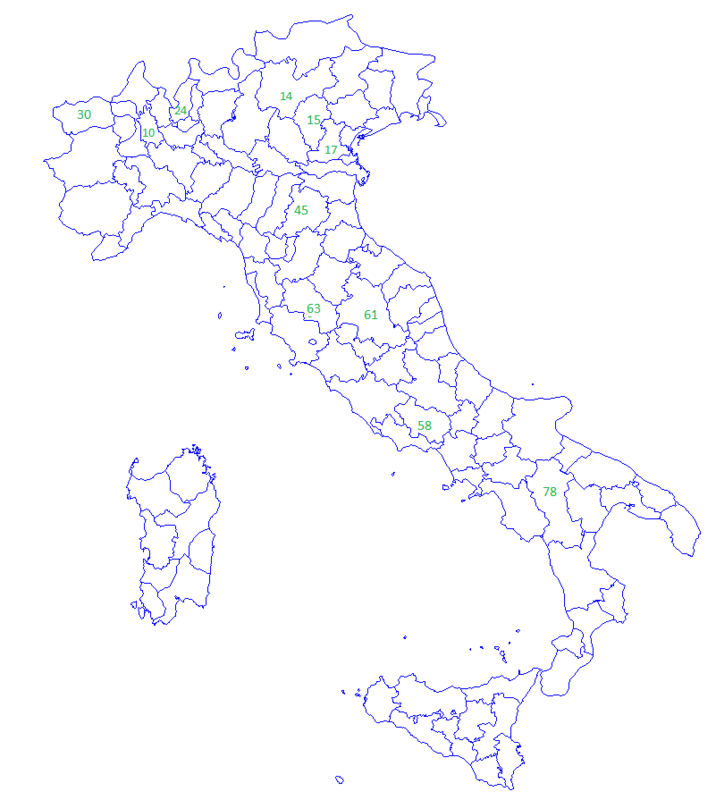 There are a total of 28 regions to traverse. Also, for extraction, subtract 3 from all numbers. Skip 2 states. Ok, those states are Alaska and Hawaii. 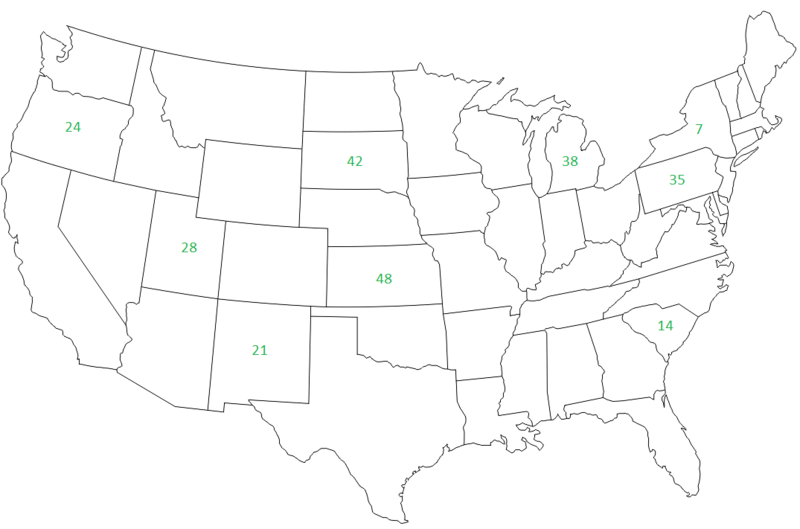 There are 48 states to traverse. Take the interstate exits to the labeled interstate from south to north. For next week’s quiz, please study the following four-letter words! C) Kind video: a toy change? The university has a strict no-cheating policy. You cannot hire other people to help do your assignment. Follow all laws and regulations for this jurisdiction. The university is not responsible for the death of any participants, and strongly encourages anyone thinking of doing something dangerous to think again until the thought passes. Test time! I hope you've been studying. Oh no! These questions are too hard for me. Can you help me out? This puzzle was co-solved by Deusovi, ManyPinkHats, Reinier, SKOG, and many hints from phenomist. The fishing float does not conduct electricity. 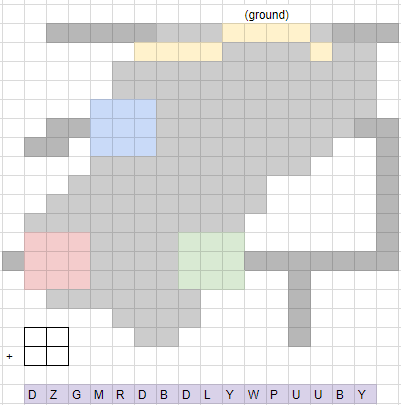 For the intended solution to the arena, add the first letters of the two teams (using A=1, ..., Z=26), then add 7. The result, mod 26 and converted back, is the remaining player in the arena after the fight. The 50V power source should be 43V. The "square root" condition should have an additional criterion, "...and not 2 mod 4". Warm Fronts part 2 is broken: you should get the number 67 at the end of everything. Skip instruction L in the bottom inductor. Swap the last two letters of the right-hand side of the cloverleaf. The section on "tonguing" should also mention that it's pretty immature to do so. The wire left of the balloon is the same as the one above it, but not the one below. Instruction 17 should be "17) If the string contains the letter Q, change the last letter to a T, and insert an O in the 5th position"
Instruction 25.3 should be "25.3) If the string contains the letter Y and the Y is not at the front, delete all the letters but last." From the end of the next section onwards, this answer has unmarked spoilers. And here, I've divided it up into sections that it could feasibly be solved in. T(a->Y)PE ("a to y change") C) Kind video: a toy change? 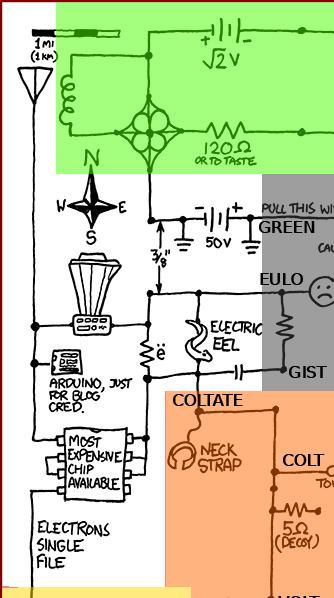 Now, there must be some way to associate these answers with the resistor network. The rules for 1-ohm resistors mention that a word can be read using them: and conveniently, we have 27 words and 27 resistors there. We can assign each node a pair of letters so the pairs spell out the resistor words. For instance, one node gets the pair TY: it is connected by a resistor to the nodes ES, PE, and AR, for the words TYES, TYPE, and ARTY. So the blue section sends AR up and left to the cyan section, and AM down to the red section. We receive AR from the blue section. It goes down and left through the functional group, up to the warm front, and up to the Magic Smoke. The functional group is a methyl group (abbreviated ME), so MARE is sent left to the orange section. But what about the input, "AR"? 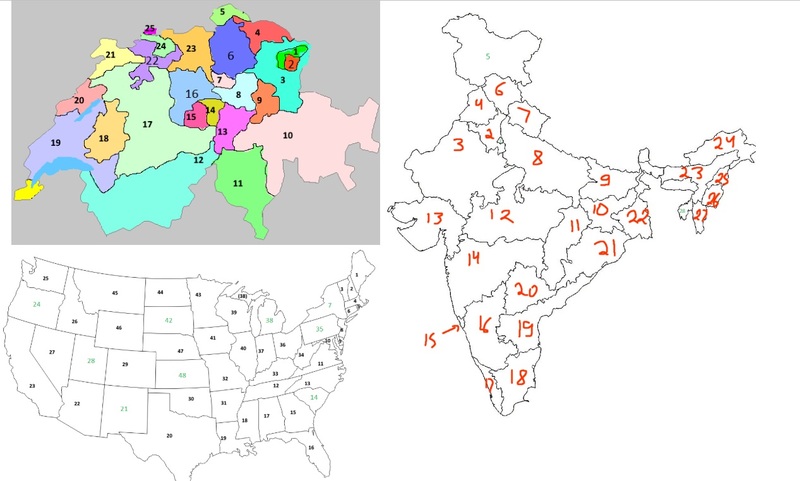 Each of these maps has a region abbreviated "AR": the Swiss canton of Appenzell Innerrhoden, the Italian province of Arezzo, the Indian state of Arunachal Pradesh, and the US state of Arkansas. The corresponding numbers are 1, 67, 21, and 31: taken modulo 26, these spell out AOUE, which gets sent upwards to the black region. The lengths of the horizontal segments in the given rows are 2, 1, 3, and 8; this spells out BACH, which is sent up to the light green section and right to the teal section. Balloons float. Letters found in the string "balloon" must be changed, moving earlier up in the string by one position. Or down. Depends on which direction you're going. A is pushed back to B, and O is pushed back to L (because of the pairs BALLOON). The text BLUE is sent upwards and left. At the upper junction, BLUE is sent up to the green section. BLUE gets "redshifted" along the tight wire to become GREEN, which is sent left to the pink section. ...which becomes EULO, and is sent left to the pink section. And because of the "nearby funeral", we know the resistor makes EULOGIST (a speaker at a funeral). GIST isn't directly sent to the pink section, but does affect it through the capacitor. Tonguing: Tongue play results in the changing of genders. It's also pretty immature. This changes MARE ("old female horse"), received from the cyan section, into COLT ("young male horse"). COLT goes both up and down; upwards, the neck strap adds the number "eight" phonetically, making COLTATE. Downwards, the 5-ohm resistor changes the first letter. From the yarn, we know the new word must be a type of car, so it must be the Chevrolet VOLT: the word VOLT is sent down, left, and right into three separate parts of the yellow section. GREEN goes through the ~~50V~~ 43V power source. N's value is 13 here: adding 43 gives 56, which in base 26 is written "35", and that becomes CE. So the output on that side is GREECE. GLUE is "blended" (anagrammed) to become LUGE. This goes up to the antenna (finally, our first output!) and down to the Arduino. The Arduino is mentioned as being for "blog cred": this hints that we need to go back to the blog. Take the entries C, R, E, D and extract from them: _a is the answer, _c is the clue. This gives "TYPE + [m]IN[d] + ROTS + [f]IX[es]": in other words, "type in rot-6". This gives the string RAMK. Finally, putting the letters in the "most expensive chip available", converting them to A=1,...,Z=26, and following the calculations gives FORAX. Electrons can travel single file, but as it turns out, these corridors are too narrow for the widest electrons over 20 points in size. These spontaneously split up into two smaller electrons each half the size of the old one. X turns into a double L, and FOR ALL is sent to the yellow section. 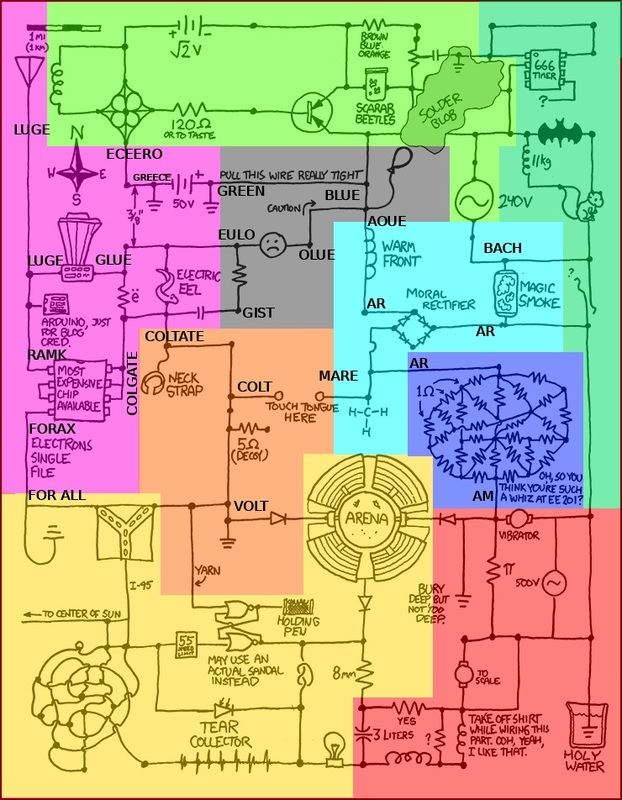 We receive AM from the blue section. Waiting 12 hours after AM makes PM. Flip that to get MP, and merge to get AMP, which goes into the arena. Everything after "tend to" should be interpreted like a cryptic crossword might. The two words are AM and [something else]; backwards and "coated with a" they make a poisonous organism. A poisonous organism fitting the pattern A+MA+?? ?+A is an AMANITA, and that means the other word is TIN. BIO goes through the second inductor: the first pass through leads to "REVERSE", and the second turns OIB into YS. The word on top of YS must also make a word with TIN and a proper noun with YS. In addition, as the "typecasting" section mentions, "yes" should be treated as a 1. So the "yes" resistor is another 1-ohm, and it must preserve length. The only thing fitting all these criteria is DEN, making DENTIN and DENYS (a male name). This gives a natural correspondence between the two sets of criteria: we can rearrange them to make both numbers and letters match up exactly. I've rearranged the number criteria here: notice how the top two grids line up perfectly. Now we use the other numbers: these also satisfy certain sets of criteria. We can use these to uniquely identify a letter that would match each number's pattern. The seven numbers given correspond to the letters R, I, O, T, E, R, S: so RIOTERS is the word that goes out the bottom (and into the sun). 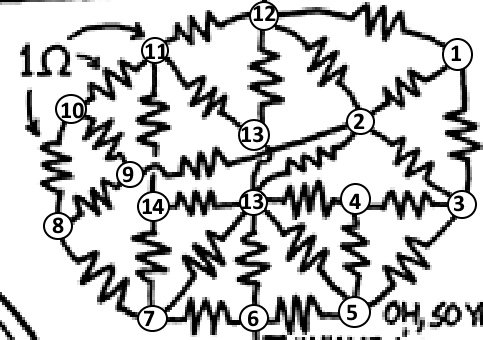 The bottom left section doesn't do anything: it's just a lot of wires and junctions, with no components. 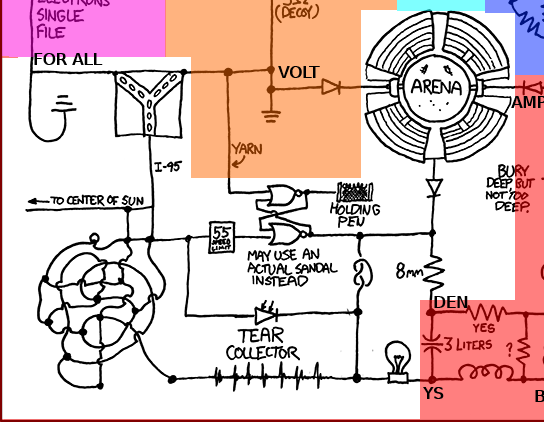 So RIOTERS goes to both the photodiode and the electrocardiograph (both labelled "tear collector"). The letters from TEAR are collected, giving IOS in the bottom right, by the lightbulb. 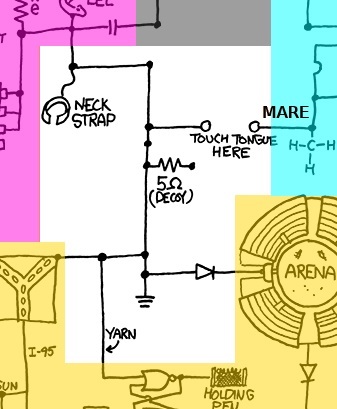 The arena gives DROID as its result, which satisfies both the 8mm resistor (making DENDROID) and the knot (the "not gate", which gives the opposite: here, referring to iOS and Android operating systems). The yarn from the orange section gave a synonym of "volt" (in a sports context) that is also a car name. In fencing, to "volt" is to evade an attack, so DODGE is the type of car. And finally, the flip-flop turns DODGE and RIOT into DROID (as confirmed twice already) and GOET: as mentioned, this is a misspelling of GOAT, which goes into the holding pen. BLUE is received from the black section, going to both the transistor and the solder blob. But what happens with the 240V AC power source? We had TIN+TIN from the other AC power source: the directions for AC power sources say that these "show character". A character ending in BACH is the fictional composer P.D.Q. Bach, so PDQ is on the other side of the power source. COMICAL goes up through the variable resistor. As hinted by the text "It wants to be a precise match, but ends up needing to be heard instead" CAESAREAN should be interpreted as half-pronounced and half-spelled, to get "C's are a(n) N". So COMICAL becomes NOMINAL. 1) There is a 4-letter substring that is a rock, replace it with a single letter such that the new word is a rock. 2) There is a 4-letter substring that relates to industry, replace the last two letters with a single letter such that the new word is a word relating to industry. MICA changes to A to make COAL, and then AL changes to G to make COG. Now BLUE and COG feed into the transformer: they swap initial sounds to make BLOG Q (sort of), and the answer to clue Q from the blog is ALBA. So ALBA goes left out of the transistor. ALBA with a resistor must make ALBACORE, so CORE is on the right of the cloverleaf. COG transforms into COE using the DC power source (rounding up to 2, as suggested). COE goes through the inductor: on the first pass, it turns into DOUBLE, and repeating with CCOOEE gives "CCEOE" as the answer. And finally, to finish off the green section: we have four different strings of letters in CORE going into the cloverleaf. The text mentions the "news core": if we change each letter in CORE to its counterpart in NEWS, we get a sequence of directions. Tracing out these directions, then taking them in south-east-west-north order ("when all is sewn up...") spells out "JOHN". The 666 timer receives CAESAREAN as its method and extra data, and PDQ as its input. This suggests that we do a Caesar shift on "PDQ", with CAESAREAN as the key. Using the 666 timer's typecasting system gives a shift of 56, and applying this shift turns PDQ into THU. So the current day is Thursday. Putting PDQ through the inductor gives EXPANDFIRSTWORD after the first cycle, and redoing it with PRETTY gives F.
What about the hanging wire below the squirrel? The description for hanging wires says "you can only conjecture what will happen". AR and TIN are the two ends of the lower hanging wire, and Artin's Conjecture is a widely studied mathematical conjecture. This means the other end of that hanging wire is GOLD, referring to the Goldbach Conjecture. ...And the squirrel now gets F and AU (gold), so the Batman symbol must just produce NA no matter what the input is, making FAUNA. According to the 666 timer, what day is it? : The 666 timer gave us THURSDAY. 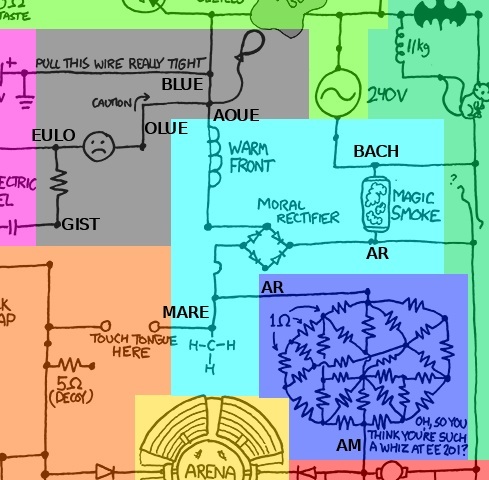 According to the new score, what should the circuit be called? : The "new score" or "news core" is the cloverleaf, giving us JOHN. What should you send to the Sun? : We send RIOTERS to the sun. What animal is being held? : The GOAT is the animal in the holding pen. What sport is on the radio right now? : The antenna is broadcasting LUGE. Finally, to establish ground truths - what does this exam do to you? There are seven grounds in this circuit: AREA (from the solder blob), GREECE and GREEN (from the sides of the 50V battery), FOR ALL (under the most expensive chip avilable), VOLT and AMP (on opposite sides of the arena), and TELLURIUM (in the holy water). These are commonly abbreviated as A, G, GR,∀, V, A, and Te. Since the "for all" ground is upside down, we flip its symbol, and put the rest together, giving us AGGRAVATE. *Choose the letter (A-E) that best represents the concept. These words are all synonyms of words that appear crossing resistors. Additionally, these words start with A-E, which gives us the letters. The extra credit question is FAUNA, as we established at the end. The meta[l] question asks: What do you wish this test was? The answers to section 2 are the nth letter of the alphabet, where n is between 1 and 5. Take the nth letter of the corresponding answer to section 1, and these letters spell out the final answer: SHORTER. This is not a solution to the puzzle, but provides notes from its poser. This type of answer has been approved by the community. Caution: This post may contain spoilers. Coming into this FTC, I had two ideas. 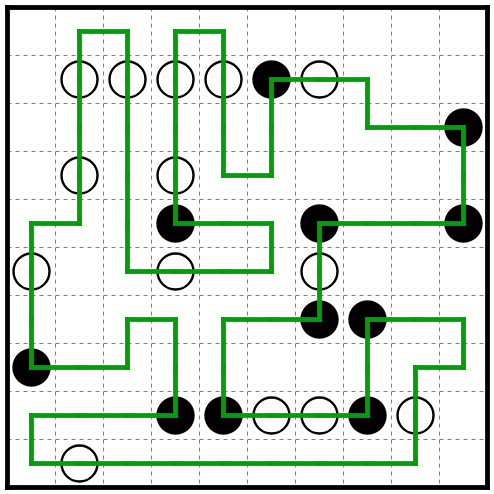 One was a more conventional subpuzzles plus meta structure. Since I'm probably not going to act on this now that FTC is over, I might as well state what the other idea was: it would be titled "Manual Override", and the subpuzzles would explicitly break the titling suggestions, being xkcd comic titles that were either not within the first 1000, too short, or uhh ok, maybe not family inappropriate, thus "manually overriding" the constraints. 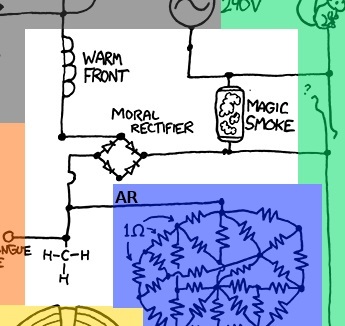 The meta mechanism would likely use xkcd mouseover text (ha, "using your mouse to ride over things"). 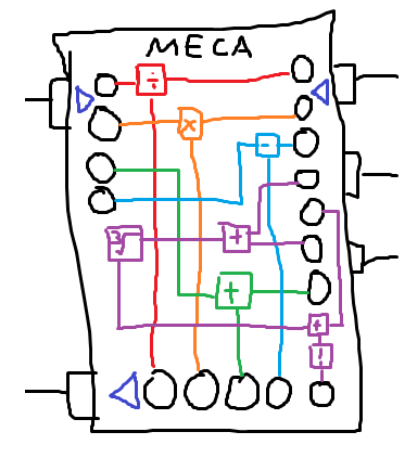 Of course, there ended up being two issues to that: 1) ManyPinkHats quickly posted a quite good puzzle set plus meta. 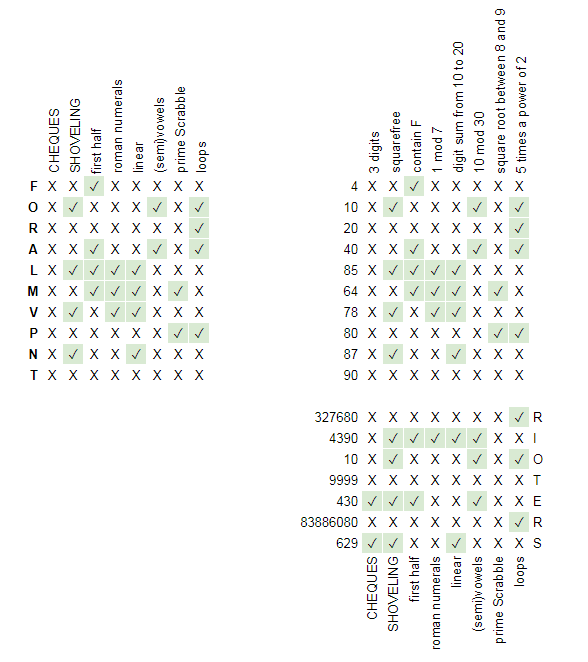 2) I really did not have that many ideas for subpuzzles. 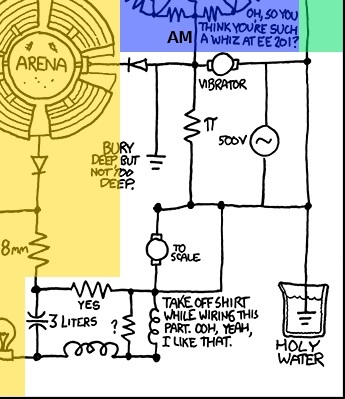 One common xkcd comic type is the "let's cram as many references into a nonsensical comic for maximum hilarity". So clearly, let's make each of these references a puzzle! What could go wrong? I'm not sure I've seen another puzzle quite like this one, so it was mainly an idea of novelty. Of course, as I was going to see during the process of development, there was a good reason why people generally don't try to "back-fill" mechanics onto an already finished thing. Anyway, the idea was basically to take that xkcd comic as is, try to transform words (well, strings. It was going to be words, but the transformations would probably be even more artificial than it already is. Then it was going to be numbers for some time, but they just seem less compelling), and additionally be subject to the constraint that repeated elements (resistors in particular) always mean the same thing. In a sense, the fact that almost everything is unique is a plus, since that allows for a lot of freedom, but it also means that you have to define everything, and solvers only get one example to extrapolate answers from. It's a double-edged sword. Mostly, I just kept track of things on one MS Paint tab to write down the current words placed, plus a spreadsheet. For the EE201 resistors, I used QXW to place the letters for me, as well as Python to cut down my existing wordlist (I started with enable2k) and cut out all of the weird words. I would continue to attempt to autofill until the words turned out mostly reasonable. There's still the TYES and LOPE but oh well. I also use various word regex/grep searches. Nutrimatic, Onelook, Qat online. Zyzzyva on my local computer. You know, standard wordplay finders. This puzzle was constructed in an order not so differently from the final solving order. I'll use Deusovi's color-coded region map for reference. [Blue] The jumble of resistors would provide a good way to create a pseudo-crossword (cryptics, of course) which would provide a launching point for solvers. From there, I somehow settled on AR and AM as my nodes, possibly due to the first autofill (which was absolutely not the autofill that I chose in the end). From playing with autofill a bit, I realized that I had a reasonable amount of freedom with my words, so I would not fill out the crossword in its entirety until much later. I would use some of this freedom to refer back to this word list twice. [Light Blue (bottom) -> Orange] From there, I went from AR to MARE by having ME engulf AR, and was like, what's the gender opposite of a MARE? A COLT, right?? (I would end up not factchecking this. I am not smart.) Let's keep going. At this point, I begin to realize that COLT is one letter off from VOLT, and AM could become AMP pretty quickly, which are both electricity related. I did want the grounds to compose a meta of sorts. So I search up words that contain VA and have roughly 7-9 letters. It would change over time, but AGGRAVATE was settled fairly early on. [Red (right)] TE + holy water somewhat informs using the element symbol for TELLURIUM, which I could justify transforming from TIN which is much more convenient for transformation. I struggled a bit with how to tie TIN and AM together, especially on a resistor. But hey, it's marked pi. AKA it's pi-rated. This puzzle is a breeding ground for dumb puns. Ok, what if we reverse the string? MA, NIT. Ah, AMANITA if we add A to both ends. "coat with A". To make the surface read better, let's just stick in the (rather general) def at the end of that. And let's ship it. You can tell about my development process already. [Gray / Pink (top/right)] The G + GR also informs GREEN and GREECE, and perhaps I could get another color on the other side of the stretched wire. I was eventually able to get the BLUE -> OLUE -> EULO -> GLUE -> LUGE chain working, noting also that BL appeared in BALLOON, so perhaps I could transform that off of AOUE. AOUE, when ROT13'ed and reversed gives EUON, which could be the start to EUONYM (a spelling bee winning word, if I recall) / EUONYMUS. But that's far rarer than EULO(GIST/GIZE/GIES). And hey look, GIST could be interpreted as an instruction to change G to T and vice versa. This fixes that part. Anyway, I think I let this sit for a few days while I try to figure out some other ways to transform words. 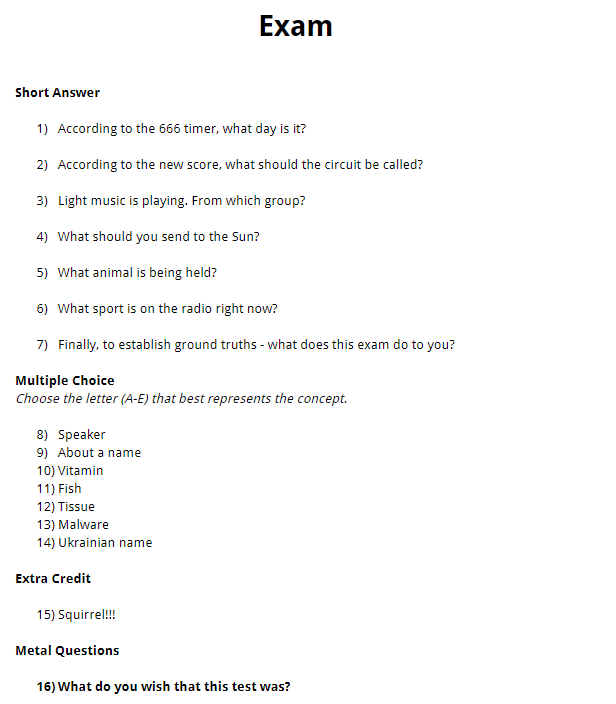 For a while I'm not sure what to do about the other endpoints, but it occurs to me that I can construct several questions to go with the grounds question and call that a test. [Light Green] I fill in this section next. I need an A for my grounds, and I come up with AREA as a reasonable substitution word. I check a word list for words that have AREA as a substring - CAESAREAN shows up, hm maybe I can come up with some sort of Caesar shift. And wait hang on, I guess it (vaguely) sounds like "C's are N"! Sounds good and it also takes care of the remaining capacitor. I then use Qat to find words that have all C's replaced by N's. The best pair I could find was COMICAL and NOMINAL. There aren't very many words that could prepend NOMINAL - COG was one of the better ones. I can then have scarab beetles eat up COMICAL. I spot CO(MICA)L -> COAL, which is kind of neat, and then CO(AL) -> COG is less so but at least keeps the "eaten word" theme. How would I use COG+BLUE though? One way I eventually decided upon doing was spoonerism, which once again (vaguely) sounds like "BLOG Q". Aha, a blog reference. I can do that. Also, how would I deal with ECEERO? Given the compass rose next to it, I thought that maybe I could get ECEERO to correspond to the four compass directions. "New Score" makes a clean bijection. It also helps that COG was very close - G just needed to be changed out. I thought I did my math right (never trust that really) when I did GREECE - GREEN = 50, so excitedly I went ahead and did COG - COE = 2. Finally I need another word that ends in, say, CORE. ALBACORE seems decent for this purpose, and I add ALBA into my crossword grid list. [Red (left), Yellow (right)] Now, I need words ending or beginning with TIN. I see BIOTIN and DENTIN. At this point I'm thinking that all of my extra resistor words are starting with A-E. I could add a checksum as a multiple choice section. After awhile, I come up with DENDROID as a word, and hey DROID could be inverted into IOS. IOS can end in YS to make IOSYS, which gives DENYS (oof, slightly off from DENIES) but at least I can say that that particular resistor (actually capacitor) is special. And likewise for the capacitor that's actually a resistor (being phonetic). [Yellow (left), Finalizing Exam] I count up all of my extra resistors - I have seven of them. Counting the endpoint answers, I also have seven-ish (maybe eight). So maybe I could make a fairly straightforward meta that ties everything up. I make a Python script to check what words I could possibly make indexing into every permutation of seven words. SHORTER does pop out as a good candidate (after all, this is a very long puzzle. Also, if you try to actually construct this you are probably going to short something.). So that fixes my ordering in the test. [Cryptics] By this time I decide to fix the word list by repeatedly telling QXW to autofill and then culling my wordlist of weird words. You would think that the setting in QXW for "slightly randomized" and "highly randomized", you know, actually randomizes each time you hit autofill, but that is false - all three settings give you deterministic fills! But oh well. Not much to say about the cryptic writing process, other than writing cryptics for 27 four letter words really doesn't leave too much room for interesting wordplay, often. [Everything else] The Arduino was also an effort to reuse the "word blog". Although by this time I had already fixed my word list and wrote up my cryptic clues. Fortunately I spotted being able to thread in ROT SIX, and added TYPE IN for good measure. The MECA I somewhat wanted it to be a recursive maze. However, due to time constraints, I ended up making the easier to construct versions that you see today. The interstate puzzle I had the general gist early on but it took a lot of motivation to finish through. However fixing attributes that matched specific (set in stone) numbers and letters was a very painful task, especially since I needed to disambiguate all of the letters. Perhaps in retrospect I should've just made all of the letter clues "letters found in ". Or even just give the list of words. Inductors I had to perform 4 rather wild transformations, so that pretty much had to be a conundrum. I came up with theming this after "If string contains " and that gave me 26 instructions to work with. That's a lot for 4 transformations, so let's double my work and make 8 transformations! I found that I would end up passing a bunch of instructions, never actually using them, so I resorted to the "perform step X+i" tactic, using string length (which is always distinct amongst them) to branch. It was unfortunate that I actually needed 28 instructions though, oops. Arena was a bad idea. 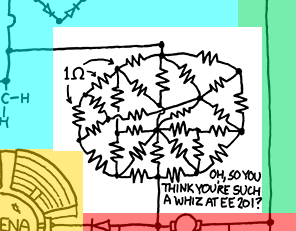 The SE in the center of the grid was purely a coincidence, wait no I meant it was totally planned as an Easter egg. LUGE is a sort of an in-joke of my MIT Mystery Hunt team, ✈✈✈Galactic Trendsetters✈✈✈. It appeared something like three times in this year's Galactic Puzzle Hunt. Of course, it appears here as well. I posted this puzzle on a THURSDAY for some time zones. That was a bit of a coincidence, since that represented the earliest possible day for which I had essentially finished and didn't really feel like working on the puzzle anymore. There were some things that I knew were bad ideas going in (overconstraint). There were other things that I also knew, but generally lacked the resources (too many conundra, probably should've gotten testsolving for an errata sweep at the very least). 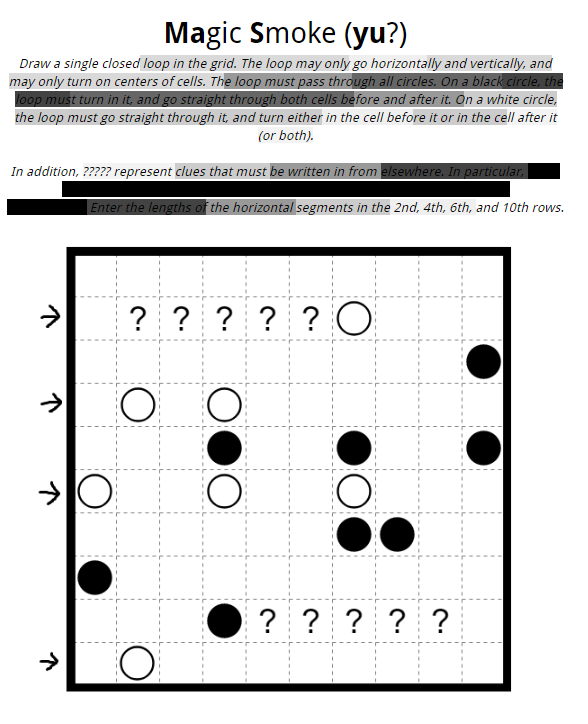 Testsolving is absolutely important for events for which your ability to intervene is limited, like in puzzlehunts (especially for top teams that don't expect to get many, if at all, hints); here, especially with being able to talk with solvers, I could at least rectify the overly jumpy sections with hinting. But the errata definitely could use some mending. Instead, I'll probably focus on slightly more concrete details that I perhaps wish that I had done. Instead of giving slightly vague descriptions, perhaps another method could be to give examples of other words being transformed. If I had the time to produce the necessary images to do such a thing, I'd probably do that. Not the answer you're looking for? Browse other questions tagged wordplay cryptic-clues grid-deduction metapuzzles network or ask your own question.